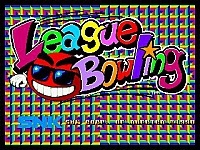 How can you possibly turn bowling into a fun console game? Before you play this game you will probably ask yourself that question, like I did. Bowling isn't exactly one of the best sports out there to turn into a game, however you will probably find yourself addicted to this after not too long! As expected, the game play is very simple. Just select your ball weight and which hand you want to use and you're away (that last sentence could be mis-interpreted, hehe :) To bowl, you have to press your button when the moving cursor hits the direction you want to throw in. After that you do the same thing with an indicator to set your power. Once the ball is rolling you can also add some spin to it by pressing the directional keys. It actually plays in kind of a similar way to most golf games. There isn't much that I can really say about the graphics. 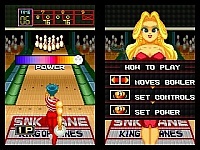 You can't exactly make a bowling game look fantastic, although there are some nice cartoon animation's for when you get a strike or miss completely etc. Things such as watching your player plummet from the top of a building or get blown up are very funny although you don't notice them much after you have seen them a couple of times. I can't really say too much about the sound. There is some fairly repetitive music during the game and some good sound effects, as you would expect. There is also a small amount of speech. Not bad considering its age and small cartridge size. This is a great little game to play if you have a few friends to play it with. It's surprising that it can be so much fun actually! In one player mode it does get very boring very quickly, so you will only use it for practice really. However, if you have three friends around this can be an absolute blast for a while and really has that �One more go, I'll beat you this time� factor that makes multi player games like this cool. i wanna try this game . 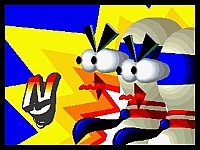 i will have to get the emulator for this one!! !